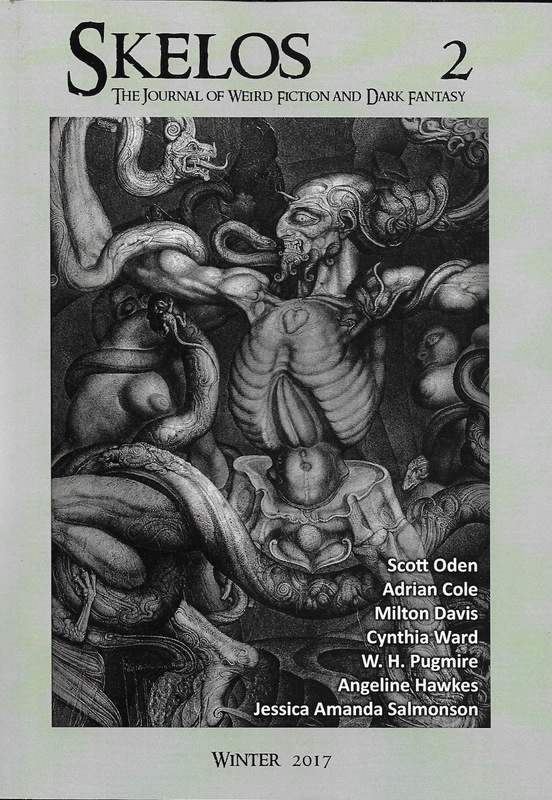 Last year we had the pleasure of reviewing the first issue of this terrific new fantasy journal and gave it a resounding welcome. Imagine both our surprise and delight upon opening the second issue and discovering it is not only as good as the premier volume but in some ways even better. Billed as repository for short fiction, novellas, interviews, art, reviews and essays, the journal does a magnificent job of covering each venue with excellent pieces, be they fiction or expository articles. Each is of superb quality and among this issue we, as any review would, had our favorites. 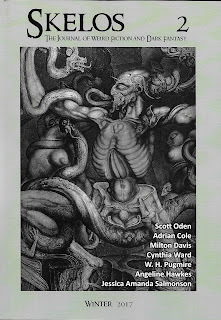 Fiction-wise, Robert M. Price’s “The Eleventh Scarlett Hell,” is a marvelous Thongor of Lemuria adventure novelette to be relished, while the short works of Milton Davis, Cynthia Ward and Jessica Amanda Salmonson were our favorites among that category. Frank Coffman is a devilishly clever poet and is his “The Wood” was particularly creepy as were “The Night Realm” by Chad Hensely and “The Mockingbird” by Pat Calhoun. Had we had similar verse in high school, English Lit would have certainly been a whole lot more interesting. We were unfamiliar with writer Arriane “Tex” Thompson until Mark Finn’s interview and may have to acquaint ourselves with more of her work in the future. “Warrior Women of History,” presented by Jeffrey Shanks with illustrations by Samuel Dillon was pure joy. One has to wonder why more hasn’t been done with these amazing characters from history. Lastly, and always helpful, were a half dozen reviews by folks such as Dave Breski, Jake Vander Weide and Keith West, to name a few. All in all, another treasure trove of both tales and artwork, beautifully designed and presented. Fantasy fans should be rejoicing loudly. SKELOS 2 is another homerun by a production staff that knows the fantasy genre inside and out. We can only dream of what they are going to do with volume 3. 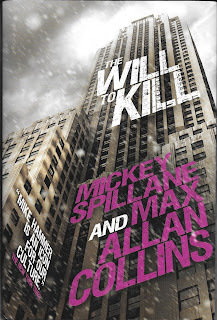 The release of yet another “lost” Mike Hammer novel by Mickey Spillane and Max Allan Collins is always a cause for celebration among mystery lovers. In this case, Hammer discovers the partial remains of a corpse floating on a chunk of ice in the Hudson River. A quick investigation determines the dead man was the butler of a one time cop turned millionaire inventor who also died via mysterious circumstances. Thing is, this retired copper was a friend of Homicide Detective Pat Chambers; Hammer’s good buddy. It is Chambers who sends the tough-guy private eye up into the Catskill to investigate both the butler’s bizarre end while at the same time learning more about the widowed inventor’s death and his four heirs. Unlike most Hammer tales, where the action unfolds on the streets of the Big Apple, this one has him up in the rarefied air of the well-to-do and their richly landscaped abodes. Once settled into the scene, Hammer gets accounted with the four siblings; two stepsons, both with hidden skeletons in their private closets, a lovely daughter and a challenged younger male with childlike qualities. All of them stand to gain from their late father’s will upon each of them turning forty years old. Of course, this being a Hammer novel, it comes as no surprise when one of the two stepsons is murdered leaving his share to be divided among the surviving three. And thus we begin to drift into a less traditional Hammer caper and more an Agatha Christie “Ten Little Indians” tableau. This by now means suggest the book isn’t suspenseful and well conceived. Only that it feels out of place in the Hammer canon. Most likely because of the setting itself than any other factor. Bottom line, any Hammer book by Spillane and Collins is going to be good, but take Hammer out of the City and something gets lost in translation. We’ve known Dwight “Doc” Decker for many years and he has a reputation as one of the finest writers in genre fiction. This is his latest collection of shorts and it proves to be a delightful, eclectic bunch covering everything from fantasy to cautionary sci-fi. The half dozen here assembled beings with “Witch Hunt” a dangerous sequel to the Hansel and Gretel and it isn’t a fairy tale. In “Extraordinary Proof,” a well known skeptic is in for the surprise encounter of his life in regards to aliens walking amongst us while “Raiders of the Future,” has time travelers going to the future to steal advanced technology. When they are captured by a futuristic librarian, it is the rookie on the team who comes up with the solution to their dilemma. “Saxon Violence,” begins with an old British vicar attempting to resurrect King Arthur during World War II and gets some unexpected results for his efforts. Had he done more historical research into the subject, his ending may have been different. “Miracle By Mistake,” is marvelous piece in which a student from the far future finds himself working with a traveling circus in 1911 and learning his own true self-worth. 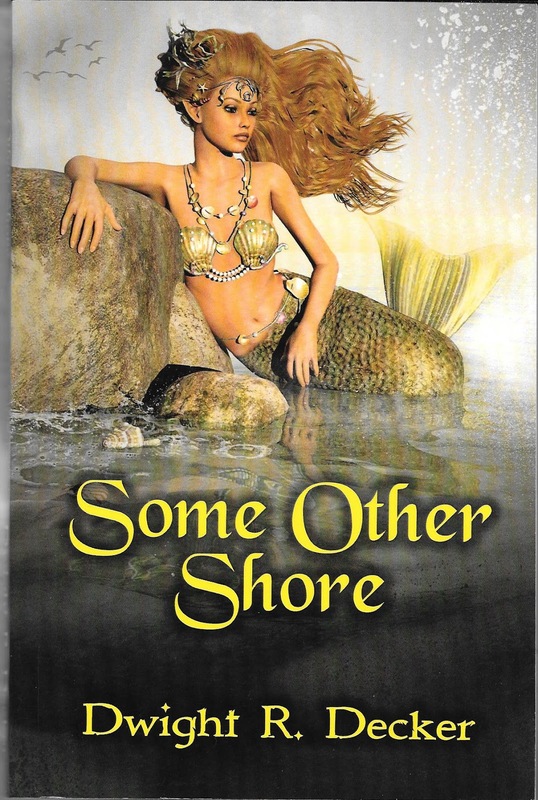 Finally we “The Last of Their Kind,” which tells of a World War II fighter pilot shot down in the South Pacific and rescued on a small island by a clan of real mermaids. 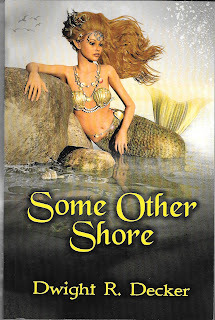 All in all, if you are on the hunt for old fashion, well told short stories, you needn’t look any further than “Some Other Shore.” Decker even includes a friendly afterword in which he relates the inspirations for his yarns. A completely fun package we hated to see end. Here’s hoping a second collection will soon be coming out way. This is a book we’ve been most anxious to get our hands on for multiple reasons. So here’s a question for all of you. What do you get when you adapt an hour long B horror movie into a full length novel? Well, if the writer chosen to do the novelization is competent, you’ll most likely get an okay prose version of the flick. Whereas if your writer is one of the finest, most capable authors in New Pulp today, what you’ll end up with is something a whole lot more intense, suspenseful and exciting than the actual source material. Now as to that latter, we have not seen writer/director Rick Montana’s little movie and are solely referring to the extremely negative comments on its Amazon page. Ouch. We don’t generally mind B movies, but those with a modicum of fun attached to them. Now back to book review. One of the first things Ferguson does is shifts the tale’s setting from the backwoods of Alabama to the northwest Florida swamps, which is a much more logical setting if the entire theme of your narrative centers around the hunt for a bigfoot type creature called the Beast. 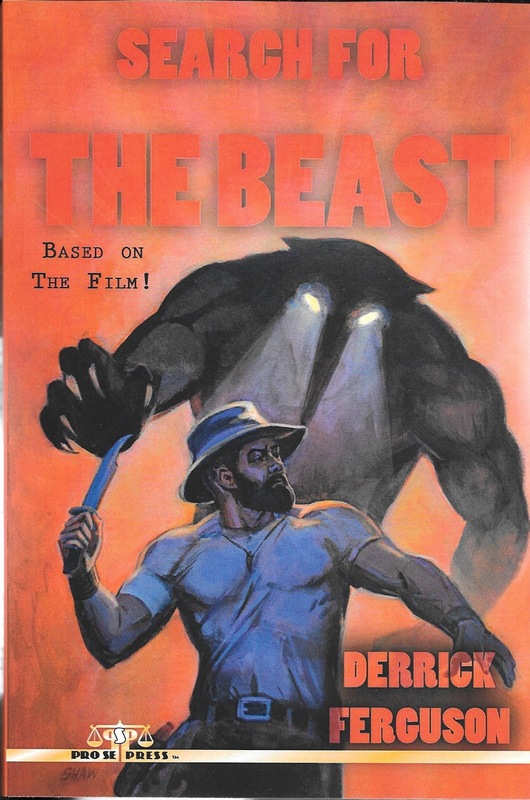 The protagonist is a former Army Ranger turned archeologist named David Stone who is quite familiar with both the Beast and his Okaloosa wilderness habitat. When the son of the area’s richest men goes missing along with his girlfriend, the father hires Stone to go and find him. He also sends along a squad of ex-military mercenaries led by one Jim Steele. Stone is rightly suspicious of Steele and his team, sensing early on that their agendas are not the same. Unfortunately Stone has made the mistake of bringing along an undergraduate student, Wendy, and he soon fears he has not only endangered his own life but hers as well. No sooner does the group get settled into their bivouac camp, then the Beast appears and savagely murders one of Steele’s men. At the same time another group of mysterious hunters materializes and Steele is convinced they are chasing after the same illegal cache he has been hired to find and destroy. All the while Dr. Stone and Wendy are caught up in the crossfire doing their best to survive both the human killers and the supernatural Beast. Ferguson imbues what is a fairly standard plot with so much verve and energy, this reviewer became totally caught up in the tale; willingly forgetting how outlandish the plot is. He is a masterful writer and gives these characters tons more depth and substance than any B movie could ever offer. Maybe some night we’ll get to see the film on cable, till then, we’re in no hurry to do so. Having read the book, we’re pretty sure we came out ahead on this one.